You too can stay forever young with 90s Television. At a distance, the members of 90s Television look like children playing on the Gallivan Center's southern steps. 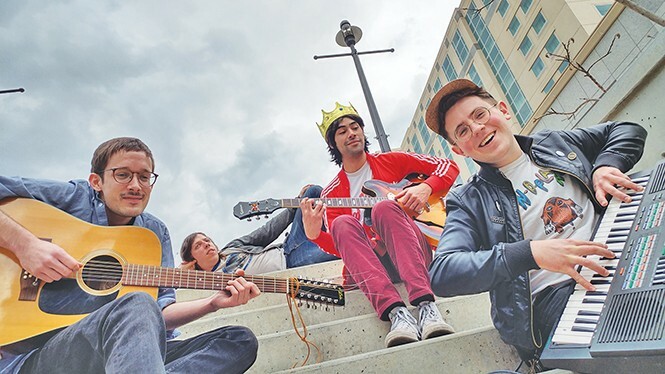 Although guitarist/multi-instrumentalist Victor Blandon wears a plastic crown and a Simpsons tee, and drummer Jeremy Devine sports a shirt by underground comics artist Nathan Ward depicting a burly, be-gloved roast turkey, they're not running around like kids are wont to do on giant steps. They're sitting still, even reclining. Plus, where would a bunch of kids get a 12-string Aria acoustic, a tobacco sunburst Epiphone ES-335 hollowbody with a portable Blackstar amp and a Yamaha keyboard? They didn't have to bring that stuff. That's 90s Television for you: always ready to give you a show. I'd tried to see them once before back in July at Kilby Court, where they were opening for David Liebe Hart of Tim and Eric Awesome Show, Great Job! fame. I missed their set by minutes because, manchild that I am, I just had to get Hart's autograph on a Garbage Pail Kid sticker, and one of his popular five-minute custom Sharpie sketches, which really slowed down the queue. All I heard of the band that night were muddy snippets coming from Kilby's cramped main room, and (I thought) unrelated chatter about toys and stuffed animals. "We went all out for that one," Blandon says. Knowing now what 90s Television is all about, his words trigger a pang of regret. "[T]he stage is dressed in colorful plush and props: a Fraggle, a baby mask, an E.T. whose raised finger looks more defiant than healing, a Christmas tree, a jack-o'-lantern, a giant two-dimensional Easter egg. And something that resembles a next-level Guitar Hero controller. It's weird. I love weird, and I really love all four of 90s Television's albums, so full of hooky, well-smithed songs that check some of my favorite musical flavors: power pop, dream pop, psych and surf. I'm sucked in ..."
The band had placed their toys just so, demonstrating a childlike yet calculated mise-en-scène. When they played, musical references—Dwight Twilley power pop, Beatles psychedelia, Donovan psych-folk, Playing With Fire-era Spacemen 3, Tall Dwarfs lo-fi indie rock—swirled around, but not together with, the visual ones. I couldn't reconcile them then. I still can't, but I still try here on the staircase because it seems as though there should be some deep socio- or psychological significance to glean from this tornado of old-guy music and kid stuff. As humans, we seek explanations, but we don't always need them. The members of 90s Television agree on one thing: "They don't really go together," Brown says. For their part, there is no logic behind the juxtaposition of these sounds and images. It's just fun. They don't even go to such lengths every time. Some shows have more set dressing, some have less and "sometimes it's just us," Brown adds. At times they discuss whether they should stop with the kid stuff, that maybe it detracts from the music. But they still do it. There is some discussion among us about certain bands, like Kiss, whose music might not hold up if they didn't have the visual aspect, the show. For what it's worth, 90s Television isn't one of those bands (although they did semi-sardonically adopt alter egos and superpowers like Kiss). Brown's been writing songs since high school in Provo. That's where he met fellow Beatles nut and songwriter Blandon, although Brown wrote, performed and recorded the "band's" first album, Raw Justice (2010), alone. Then the two paired up, enlisting Murray a few years later, and Devine about a year ago. From Raw Justice through Going Blonde (2012), Small Pumpkin (2013) and Bad 4 the Tooth (2014) and last year's single "Karmakazi," the band has made some of the coolest, cleverest, most honest and fun music in Salt Lake City. And seemingly without effort. They're just being who they are: four 20-something dudes with keen senses of humor and style.